r a m y h a n n a . c o m: Why don't my caustics in mental ray render? 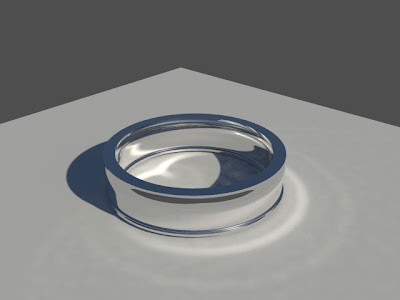 Why don't my caustics in mental ray render? There are just a few settings to get caustics to render properly in mental ray. But if they aren’t on, you’ll never get caustics. So how do you get caustics to work in mr? •Put a light in your scene. •If you’re using the A&D material, be sure to make it reflective. If it doesn’t reflect it won’t create your caustics. •To create the actual caustics effect, in the render settings, under caustics and GI, be sure Enable under caustics and GI is checked. It’s not enough to have Enable under caustics. Mental Ray actually uses photons to fake the caustics, that’s why caustics render so quickly in mr.
•Ok, so you’ve got your light source, your shiny object, and caustics are on, but when you render still no caustics effect. •Right click on your object that you want to cast caustics, and select Object Properties. Go to the mental ray tab. Notice that Generate Caustics is not checked. Turn it on. By default mr has this turned off for all objects, because it is assuming that they aren’t creating caustics. If this was on for every object and you had caustics on in your render settings, it would be very costly, so this is done as a precaution. That’s it! Note: if you are using transparent materials to generate caustics, check the advanced options in you’re A&D shader and use Refract light and generate Caustics effect.